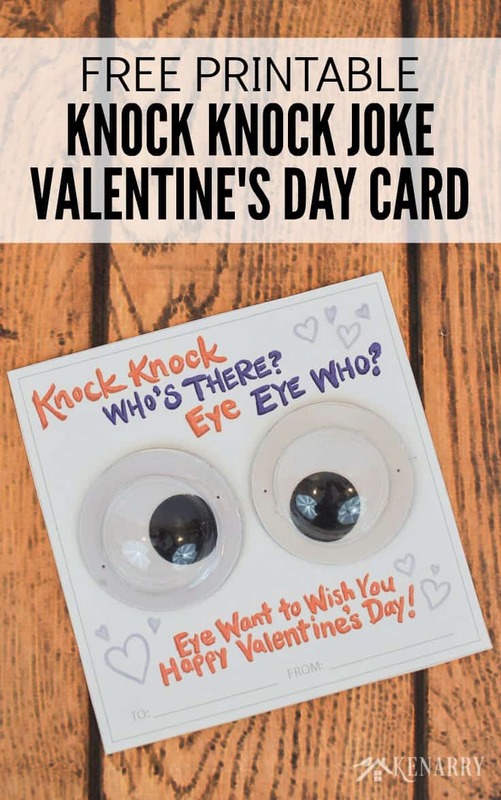 Download free printable knock knock valentines for kids. 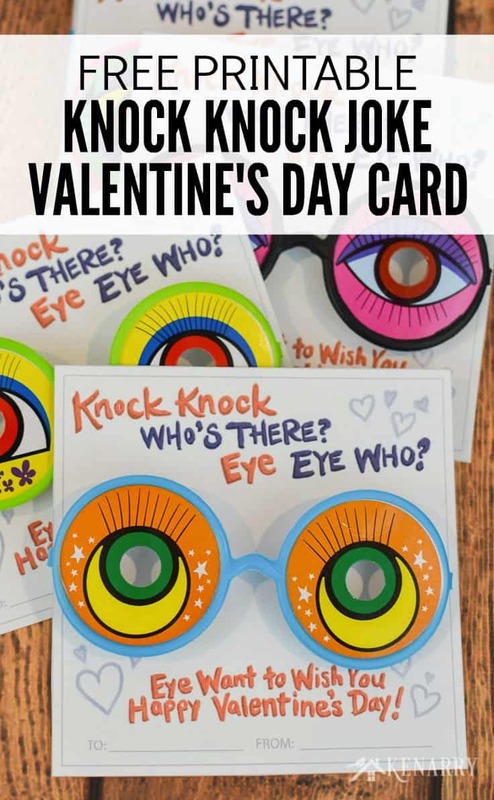 Your child will love giving these funny valentine cards with a knock knock joke to friends at the school Valentine’s Day party. Knock, knock? Who’s there? 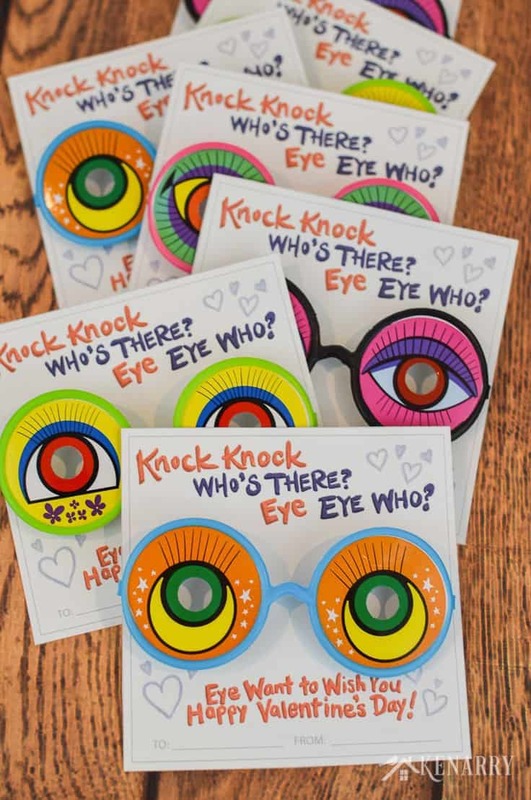 Your new Free Printable Knock Knock Valentines for kids! 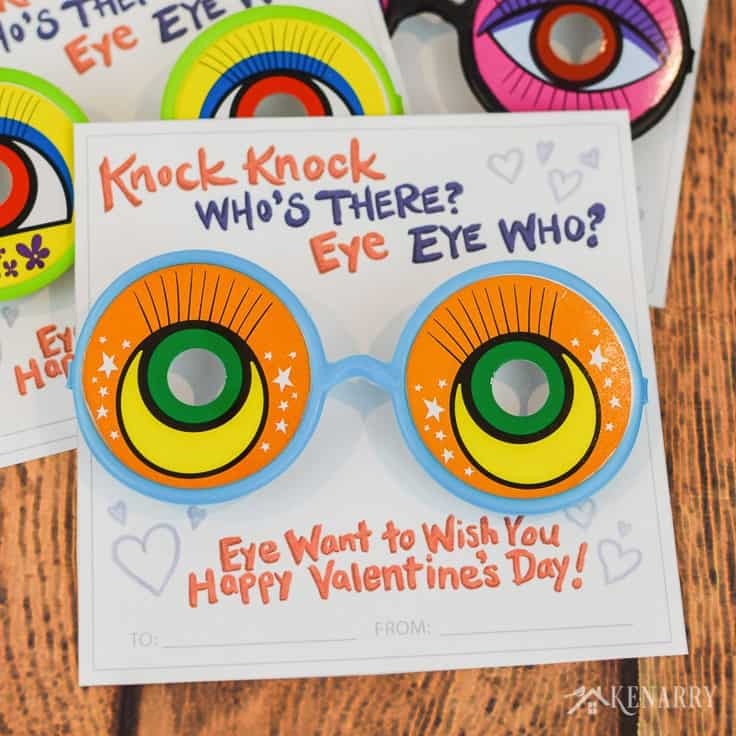 Dress up these adorable valentine cards with inexpensive funny glasses, large googly eyes or even sunglasses. Your children will love giving these to their friends for Valentine’s Day this year. I love creating fun birthday treat tags and Valentine cards for my boys to give to their friends at school. When our youngest son who we call “C2” here on the blog started attending preschool last year, he was adamant that he wanted funny Valentine’s Day cards. I’m sure this choice was highly influenced by the Car Valentines with a funny joke that we created for his big brother’s class. Doesn’t every little brother want to do whatever his big brother is doing? At four years of age, knock knock jokes were C2’s very favorite kind of joke to tell. But before we could select a joke for his valentine cards we wanted to find some sort of treat or trinket to go with them. With that in mind, we headed to our favorite dollar store and wandered up and down the aisles. We were looking for just the right thing to catch our eye (pun intended! LOL!) that we could attach to the valentine cards. 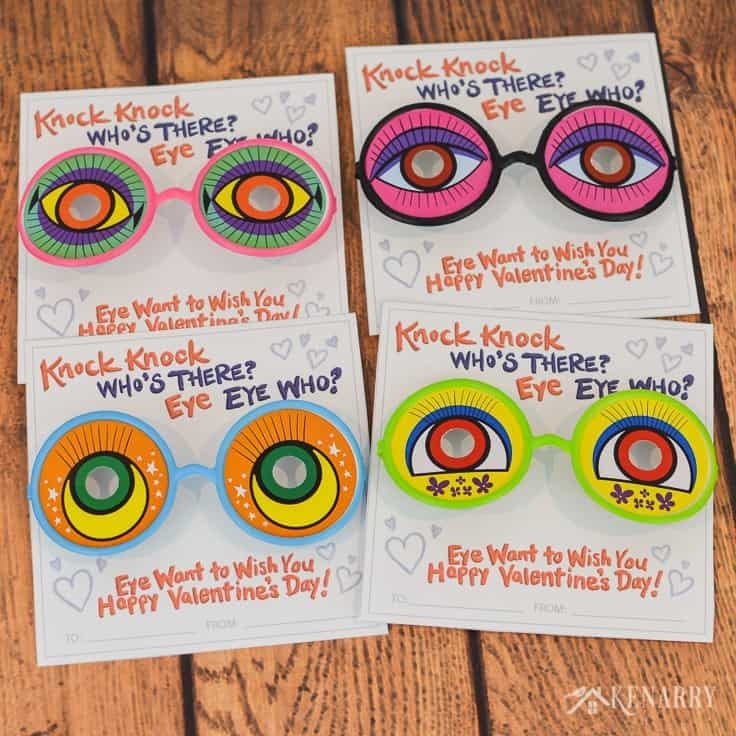 C2 knew instantly when he saw the 4 packs of silly eyeball glasses that they would be perfect for his knock, knock valentines. Eye want to wish you a Happy Valentine’s Day! This one was easy for C2 to understand and he just kept giggling and repeating it. 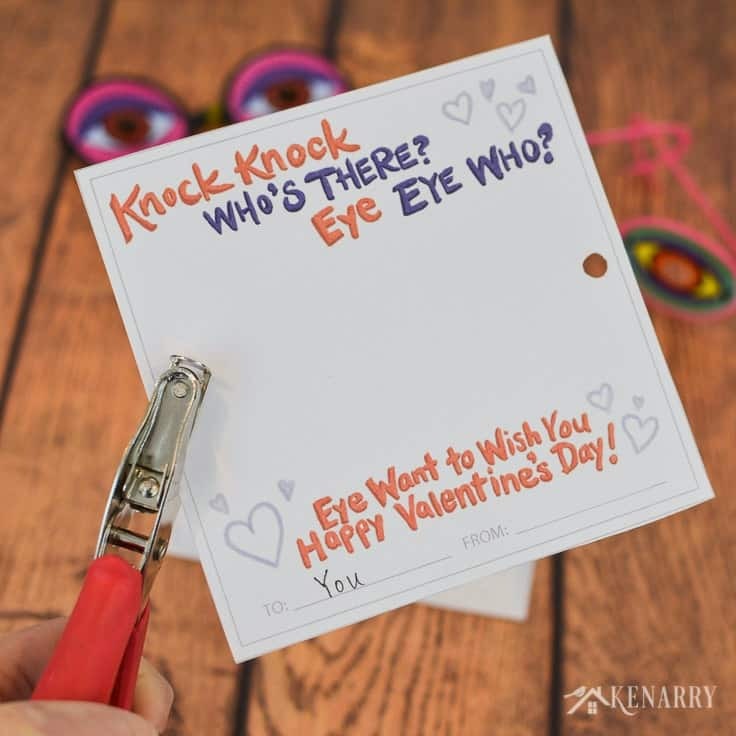 Chances are your preschool or elementary child and his/her classmates will love this joke too so we wanted to make the Knock, Knock Valentines we created available as a FREE digital download for Kenarry Idea Insiders. 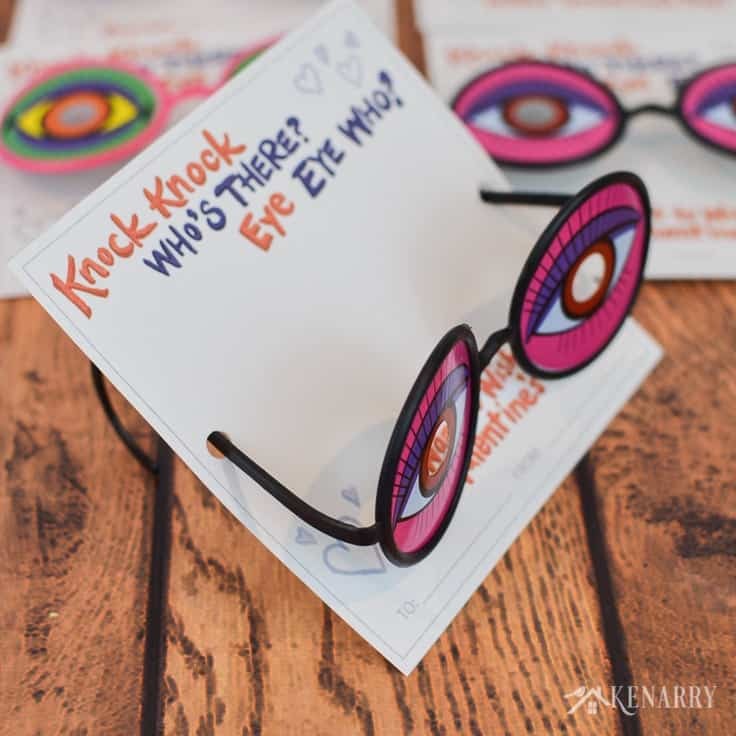 These funny knock knock valentines for kids use silly glasses or googly eyes as a Valentine’s Day gift that will have your child’s classmates rolling with laughter! 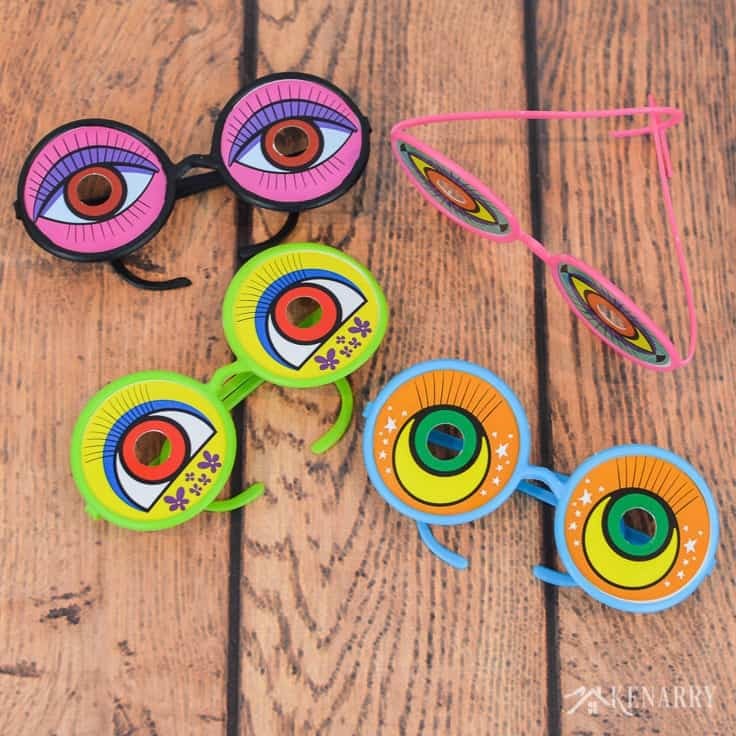 Novelty kids party eyeglasses – any kids’ toy eyeglasses will work. I couldn’t find the ones I got at our dollar store on Amazon, but these are very similar and made by the same manufacturer. 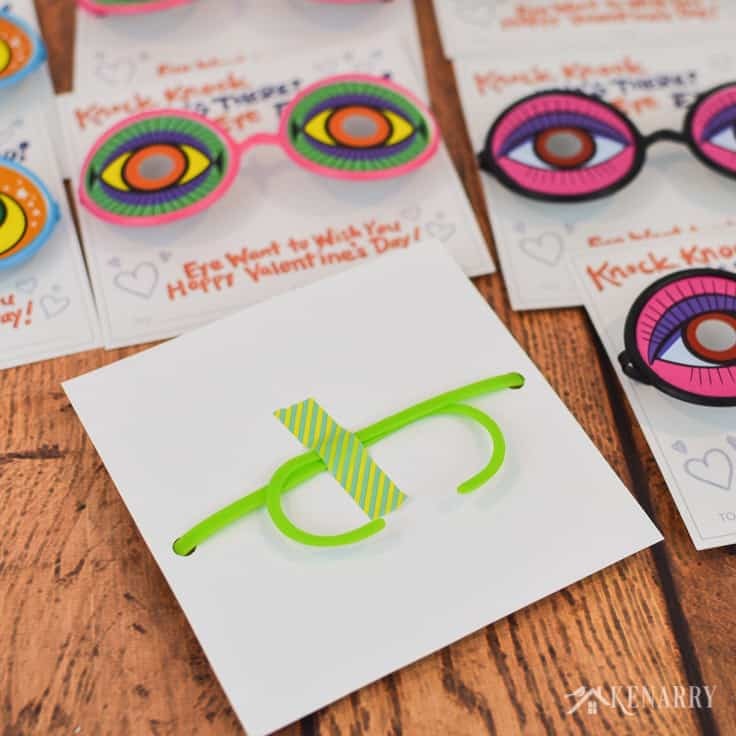 Or skip the eyeglasses entirely and glue large googly eyes on the valentine cards! I had these large ones leftover from making the boys’ firefly costumes for Halloween. 1. 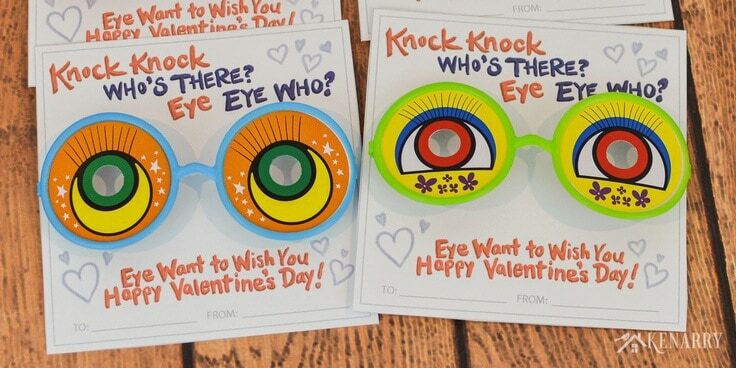 Get the free printable Knock Knock Valentines. 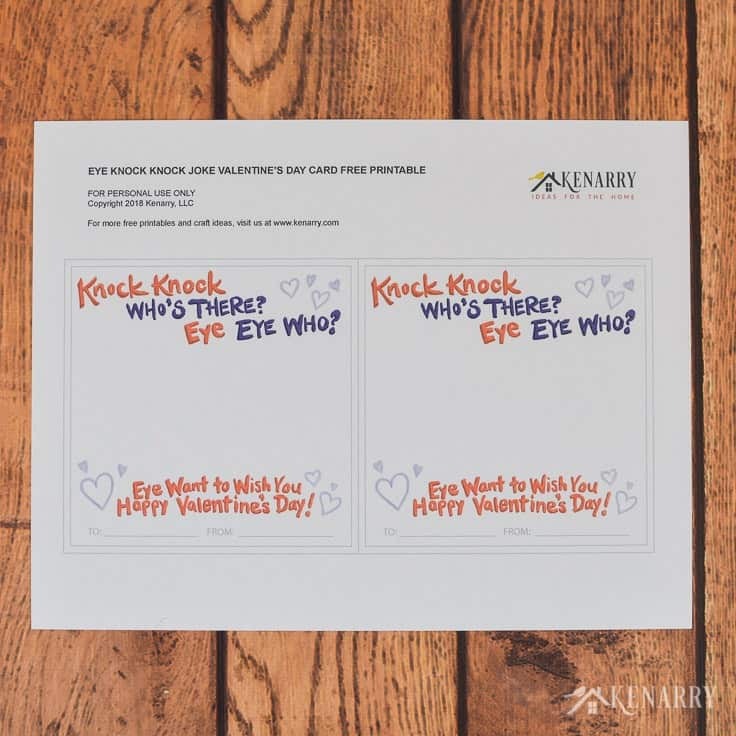 The printable Knock Knock Valentines are available as a FREE gift when you sign up below! Then you just need to download the PDF file and save it to your computer. The Knock Knock Valentines and all other free printables from Ideas for the Home by Kenarry™ are for your own PERSONAL USE ONLY. 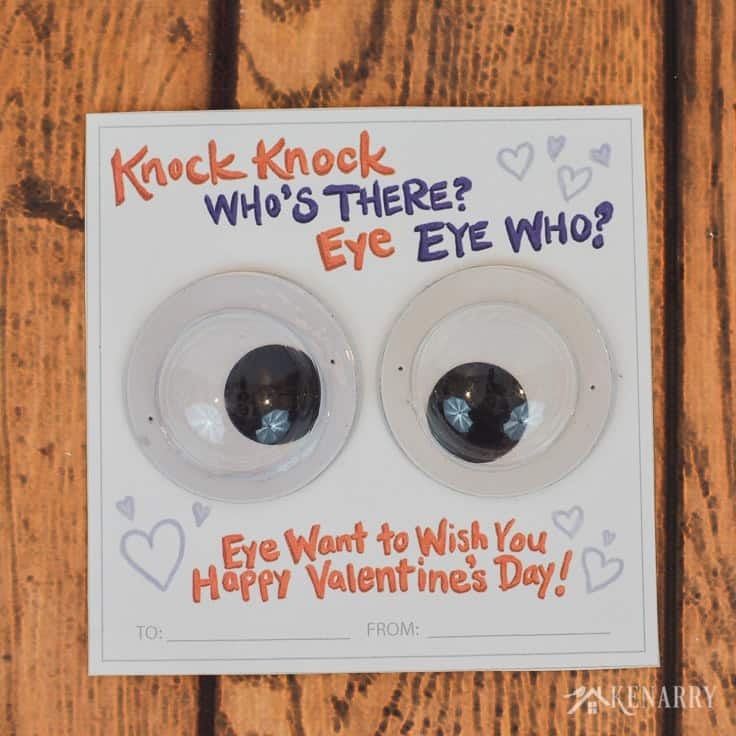 Once you have the file, print the Knock Knock Valentines in color on white card stock. 2. Cut the Knock Knock Valentines apart. Cut the valentine cards apart. For straight lines, it’s often really helpful to use a paper trimmer. I sometimes like to just use scissors though. 3. 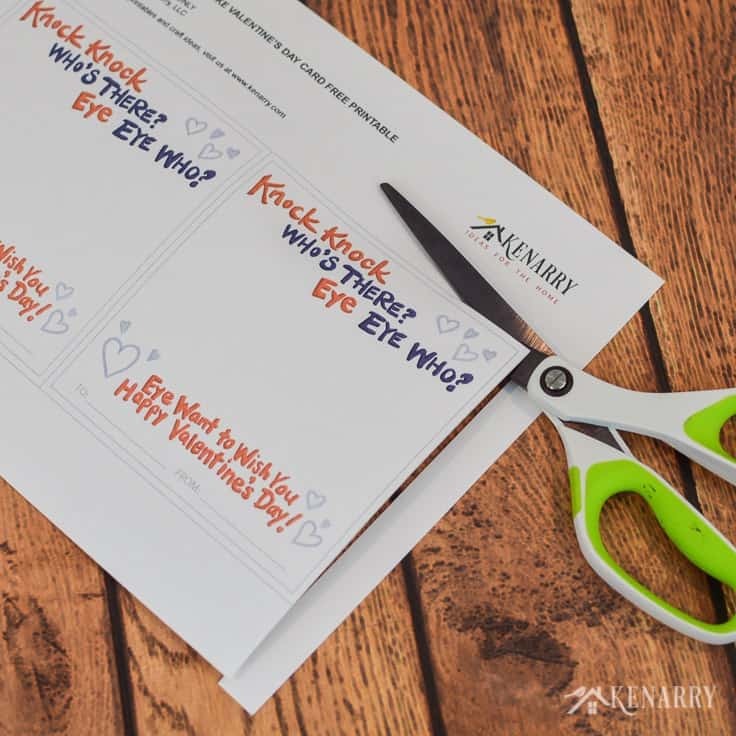 Sign the Knock Knock Valentines. If your child is able to write, have your child spell out his or her name on the Knock Knock Valentines. We learned from our older son’s preschool teachers that they usually prefer the kids not address cards to specific kids. Since the kids are just starting to learn to read, it makes the whole distribution process at the Valentine’s Day party go much faster if they can hand the valentine card to any kid. 4. Punch holes in the Valentine’s Day cards. Next, use a single hole punch to create two holes in the Knock Knock Valentines. You’ll want one hole on the left side in the middle of the card. And the second hole in the middle of the right side. This will allow you to easily insert the novelty glasses in the next step. 5. Attach the novelty glasses. Insert the stems of the funny eyeglasses through the holes you just created and fold the glasses closed. If you’d like, you can use washi tape to secure the glasses in place. The ones we bought kind of wanted to pop back out of the holes. So I was worried that the glasses may slide out of the cards when my son passed them out to his class on Valentine’s Day. Now you have a colorful and fun gift for your child to give as valentines at school! I have tried to subscribe and get this a couple of times…any tricks?! We’re so sorry to hear you’re having difficulty subscribing. Our records show that you still need to confirm your e-mail address. Can you please check your e-mail inbox again and look for a message from [email protected] asking you to confirm your subscription? The subject line of the e-mail should actually be “Important: confirm your subscription”. You may need to check your spam folder or your trash to make sure it didn’t end up in there by mistake. 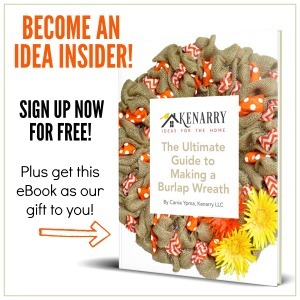 Once you click on the button in that e-mail to confirm your subscription your web browser should immediately redirect you to the Idea Insider Resource Library where you’ll find this free printable and all the others that are exclusive for our Idea Insiders. If you can’t find the e-mail message asking you to confirm your e-mail address in your inbox, please let me know as soon as possible and we’ll figure out another way to get you subscribed!